Dairies produce methane and carbon dioxide gases due to the anaerobic liquid processing of animal waste in oxygen free lagoons, ponds and holding tanks. Manure related methane gas emissions have recently fallen under increased scrutiny in many states. Historically, dairies have used open lagoons or flared methane gases, resulting in undesirable increased carbon emissions. New environmental laws, at both the state and federal levels, have regulated manure management options, restricting it to enclosed lagoons. These stringent regulations have propelled the dairy industry to look for new ways to dispose of these gases. Commonly referred to as biogas, conditioned methane gases can be used as an alternative to natural gas. Dairies have an opportunity to produce significant amounts of energy through the conditioning of their available biogases. Financial benefits and improved community relations now provide dairies with multiple incentives to employ biogas conditioning systems to manage these gases and create clean, renewable energy. Biogas conditioning systems are used in a variety of industries other than dairies, including wastewater treatment facilities and landfills. Utilization of these biogas conditioning systems can provide dairies with an opportunity to collect and dispose of the high levels of methane found in livestock waste gases. Currently, many dairies use untreated gas containing impurities such as; sulfur, chlorine, silicon and moisture, to generate power and fire boilers. This untreated gas can make existing equipment such as boilers, engines, fuel cells and turbines more susceptible to increased damages, increased maintenance costs and shorter life spans. Power generation equipment suppliers have specific inlet gas requirements. Western Biogas Systems provides dairies with gas conditioning systems which meet these requirements. 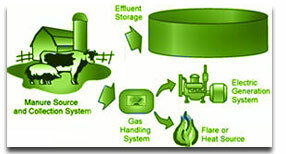 Biogas conditioning for power generation in dairy applications involves the removal of H2S and moisture (dehydration). This conversion of methane to energy producing biogas results in a clean renewable energy for power generation. Biogas conditioning for pipeline injection applications requires further purification involving CO2 removal. This gas may then be converted to valuable pipeline gas, providing additional financial opportunities. Cogeneration is also a valuable option. Revenue increases may also be generated by carbon credits. Carbon credits can be obtained when biogas is captured and not released to the atmosphere. In exchange for capturing these emissions, credits are issued as part of an international emissions trading plan. Polluters from other countries can purchase these credits, which are sold on the open market. Western Biogas Systems consults with dairy industry teams to explain the biogas conditioning concepts and designs a biogas conditioning system specific to each plant’s needs. The most cost effective system is engineered and then fabricated to those unique specifications. Western Biogas Systems provides ongoing project consulting and directing. Additionally, project start-up services, gas sampling, maintenance plans and performance guaranties are also available. Let Western Biogas Systems be your partner in finding solutions for converting livestock waste gases to clean, reusable energy. Together, we can produce a system which provides for the reduction of carbon emissions, reduced equipment replacement costs, increased revenue earnings and positive community relations.